February 15, 2012 11:21 ET | Source: Pacific Potash Corp.
VANCOUVER, BRITISH COLUMBIA--(Marketwire - Feb. 15, 2012) - Pacific Potash Corporation (the "Company) (TSX VENTURE:PP)(OTCQX:PPOTF)(FRANKFURT:P9P) is pleased to provide results for the first wells drilled and cored within the company's 100 per cent owned Provost Potash Property, located near Provost, Alberta. The Provost Potash Property encompasses 17,781 hectares along the Alberta-Saskatchewan border, approximately 45 km west of the historic Unity Potash Mine near Unity, Saskatchewan. Steve Khan, Director and CEO of Pacific Potash, commented, "Our goal with the 2011 drill program was to confirm the presence of potash within Alberta, and we are excited to announce that we are the first company ever to drill for and discover potash within the Province. These results confirm our initial analysis of the property and we look forward to future drilling and development of a potential potash resource within the top ranked mining jurisdiction in the world." Drillhole PPC-37, located within the south-central part of the property and completed in early November, 2011, intersected and cored two zones of sylvite mineralization (Upper zone and Lower zone) within the Patience Lake Member, near the top of the Prairie Evaporite Formation. A second hole, PPC-38, completed in late November, 2011 and located about 10 km due north of PPC-37, intersected and cored the Lower Zone of sylvite mineralization. Core samples from drill holes PPC-37 and PPC-38, were collected by Norwest Corporation in Calgary, Alberta and forwarded to the Saskatchewan Research Council's Geoanalytical Laboratories in Saskatoon, Saskatchewan. Analytical results from PPC-37 indicate weighted average grades of 11.85% K2O (18.76% KCl) over 10.01 feet (3.05 m) within the Upper Zone at a depth of 4353.67 feet (1327.25 m) and 21.25% K2O (33.64% KCl) over 1.31 feet (0.40 m) in the Lower Zone starting at a depth of 4401.57 feet (1341.80 m). A summary of the analytical results for both the Upper Zone and the Lower Zone is shown in Table 1. Low grades of MgO indicate that sylvite is the major potash mineral, rather than carnallite. Drill intercepts represent true thickness as the holes were drilled vertically and the potash zones are flat lying. *KCl is calculated as K2O multiplied by 1.583. Analytical results from PPC-38 indicate that the Upper Zone is not present at this location, but the Lower Zone is, and maintained at weighted average grades of 21.55% K2O (34.11% KCl) over .98 feet (0.30 m) with low grades of MgO. At this location the Upper Zone may be missing due to a local reef or other subsurface feature, which prevented the deposition of potash at this site. Alternatively, the potash may have been eroded given it's proximity to the Prairie Evaporite - Watt Mountain Unconformity. The potash stratigraphy, as derived from recent drilling and historical well logs on Pacific Potash's Provost Property, suggests a strong northwest to southeast orientation. Historic gamma ray logs from PVR Provost 4-18-38-1W4, located approximately 5 km southwest of PPC-38, indicate strong sylvite mineralization with an estimated grade of 25% K2O (39.56% KCl) over 7.39 feet in the Upper Zone and 15.3% K2O (24.22% KCl) for the Lower Zone. The use of gamma ray logs to identify potash layers, while an important exploration tool, is dependent on many variables (background radiation levels, calibration errors, size of individual beds, etc.) and is not an absolute measure of grade and thickness. Estimates for K2O are based on Schlumberger's (1974) approximation of 15 API = 1% K2O for potash bearing units. Until these intervals are confirmed by chemical analysis, they should not be considered as an absolute measure of grade across width. 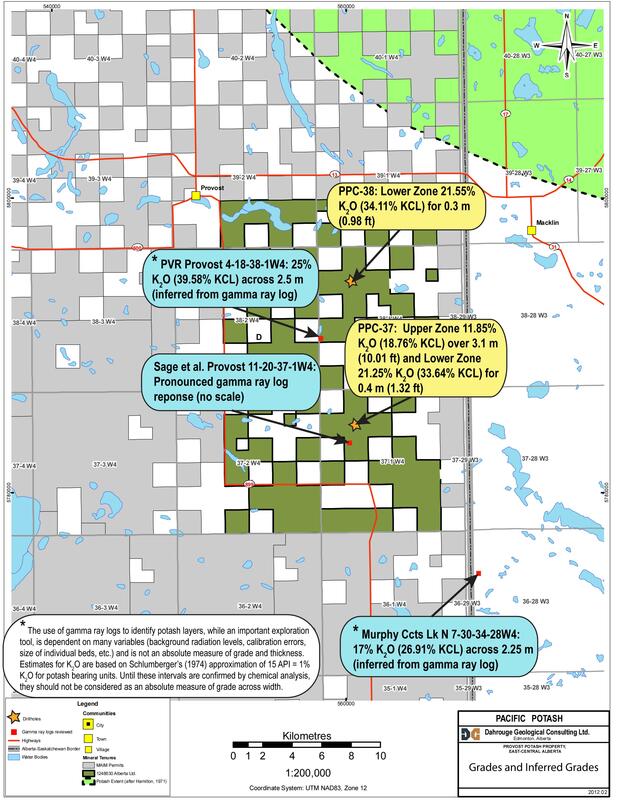 However, potential targets for future exploration drilling will likely be concentrated in the unexplored areas proximal to PVR Provost 4-18-38-1W4. Jody Dahrouge, P.Geol., senior vice-president of exploration for the company and a qualified person for the purposes of NI 43-101, has approved the preparation of the technical information in this news release. Pacific Potash Corporation (TSX VENTURE:PP)(OTCQX:PPOTF)(FRANKFURT:P9P) is engaged in the exploration and development of the Provost Potash Property and the surrounding potash claims located in the prolific Prairie Evaporite Formation, which is host to multiple conventional and solution potash mines. The Company is also actively looking to acquire other prospective potash assets in North America. This press release contains forward-looking statements. All statements, other than of historical fact, that address activities, events, or developments that the Company believes, expects, or anticipates will or may occur in the future (including, without limitation, statements regarding the estimation of mineral resources, exploration results, potential mineralization, potential mineral resources, and mineral reserves) are forward-looking statements. Forward-looking statements are often identifiable by the use of words such as "anticipate", "believe", "plan", "may", "could", "would", "might", or "will", "estimates", "expect", "intend", "budget", "scheduled", "forecasts" and similar expressions or variations (including negative variations) of such words and phrases. Forward-looking statements are subject to a number of risks and uncertainties, many of differ materially from those discussed in the forward-looking statements. Factors that could cause actual results or events to differ materially from current expectations include, among other things, without limitation, failure to establish estimated mineral resources, the possibility that future exploration results will not be consistent with the Company's expectations, the price of potash and phosphate, changes to regulations affecting the Company's activities, including tax and trade laws and policies; delays in obtaining or failures to obtain required regulatory permits and approvals from government authorities; delays in commencing the Company's proposed drilling program, exploration costs varying significantly from estimates; uncertainties relating to the availability and costs of financing needed to complete exploration activities and demonstrate the feasibility of the Company's projects; the success of future exploration and development initiatives; and other risks involved in the mineral exploration and development industry. Any forward-looking statement speaks only as of the date on which it is made and, except as may be required by applicable securities laws, the Company disclaims any intent or obligation to update any forward-looking statement.